A player doesn’t come up and start in the big leagues at the age of 22 unless he’s crazy-talented or the team he plays for is desperate. 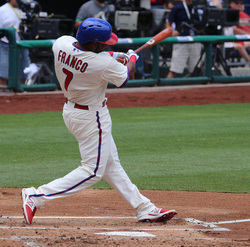 In the Phillies’ case, it’ both, and Maikel Franco is their guy at third base. In 2015, Franco played in just 80 games, but he was on pace for 25+ HR, 100 RBI and 90 Runs scored along with his .280 average. We’re actually tempted to rank him higher, but, again, the “we’ll believe it when we see it” mentality keeps us from putting him in the top 10, especially because he spent half of last season injured. Maikel Franco is only 23 years old, so there’s no reason he shouldn’t bounce back from just about any injury. In terms of fantasy ownership, we wouldn’t blame you for taking Franco ahead of guys like Justin Turner, Adrian Beltre or a few other guys ahead of him in the rankings, but with just one year under his belt – actually a half-year – we’d rather be safe than sorry. Having said that… if you start to see the third basemen go early on in your draft, or if you’re in an auction draft and the crowd of third basemen starts to thin out, don’t be afraid to bid Franco up, even to $20. The upside on this guy is worth a bit of a gamble but hold off on him as long as you can just to see if you can get him for a better price. Maikel Franco was on pace for a 28 HR, 100 RBI, 90 Run season in 2015. We see big fantasy stats coming his way in 2016. *On pace for “only” about 100 strikeouts; relatively speaking, this shows good plate discipline, especially for a guy who's just 22. *22 doubles and 14 HR indicates line-drive power. This means he hits the ball hard (duh). Couple this with his relatively-low strikeouts and you can expect big RBI and Runs scored. He’ll be on base all the time. *Combined .278 Batting Average in AAA (166 games), including a .355 average in AAA in 2015, shows that Franco is more than ready for the big leagues.